There is a fabulous exhibition of artist's books currently on display in my city of Winnipeg. 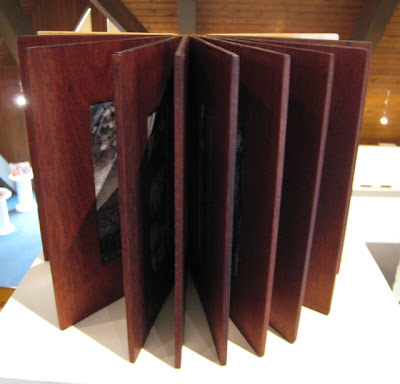 Bound by Nature is a group exhibition inspired by nature, landscape and books, curated by artist Deborah Danelley. 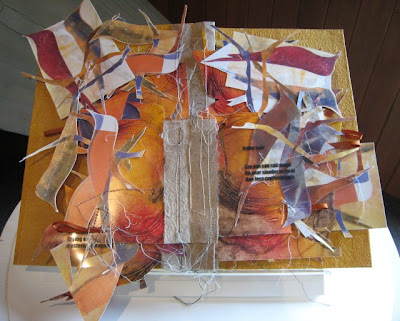 I thought I would share with you here just a few of the varied and interesting book structures used by some of the artists. Wildflowers by Deborah Danelley and Carol Leach. 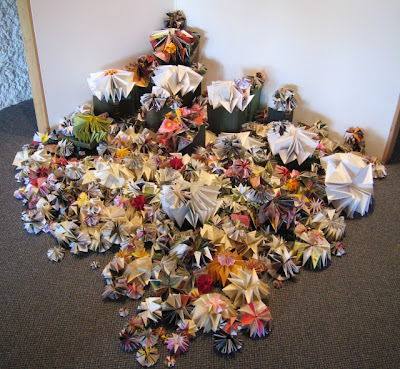 Imagine a room filled with origami fold books! The pages for these books were recycled from garden, nature and landscape books and catalogues. To get an idea of scale, look at the traditional books used as part of the display. Oeuf Bibiotheque/The Egg Library by Erwin Huebner. 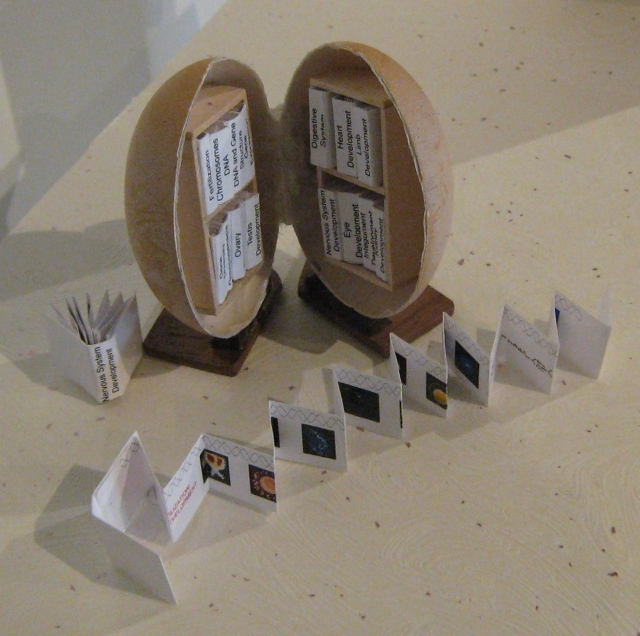 Each miniature booklet contains developmental information and DNA genetic codes related to cell biology. (Yes it is a real egg shell). Bird Haiku by Lorraine Douglas, a flag book with stencil and collograph prints. as often as I look....I am able to see by Wendy Cooper-Parkinson, woodwork by Derek Houghton. The covers. as often as I look....I am able to see by Wendy Cooper-Parkinson, woodwork by Derek Houghton. The pages. The exhibition will continue on display at the Mennonite Heritage Centre Gallery in Winnipeg until June 18. If you can't make it here for the show ( ;-) ) I have a few more images posted on my blog here. 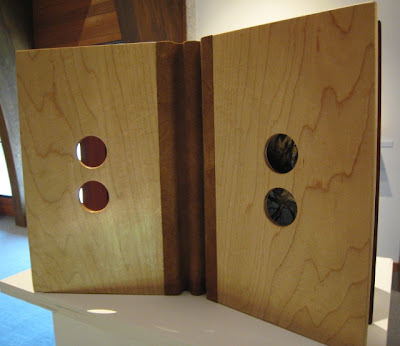 It's great to see experimental and art books on display - showing there is so much more to book-binding than most people imagine or understand. Thanks for this post - very interesting!